22.5" Mosaic clock with decorative embossed metal mosaic - handsome black clock face accented with silver and charcoal black mosaic glass case. The ultimate luxury wall clock. 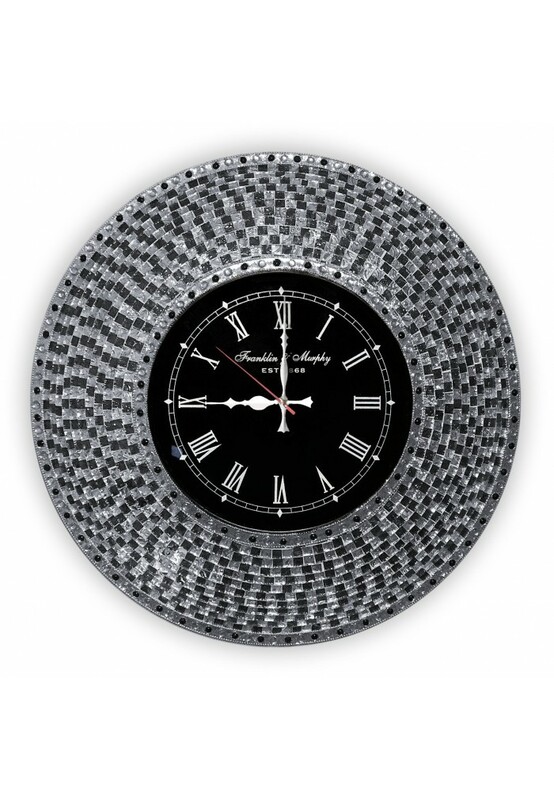 Detailed, Artisan Handmade Glass Mosaic Wall Clock in Chic Metal Style is a True Statement Piece, Intricate Artistry is Evident in Clocks Composition. Zoom in to see the intricate artistry and mosaic work! I'm updating my living room decor and needed to replace my favorite Bulova mosaic clock, because it no longer matched :(. I've been looking at clocks for over a year and just couldn't find anything I liked, as most modern clocks are made out of plastic. I was happy to stumble upon this clock here on Amazon. It has some weight to it, as it's made out of metal and glass. It's definitely unique. It's very large. The glass pieces catch the light and sparkle, but it's not over the top. It's rounded in the front- even the face, which I did not expect. It came well packaged and in perfect condition.